Deputy Chief Justice Owiny-Dollo at Parliament last Friday. Photo by Beatrice Leni. 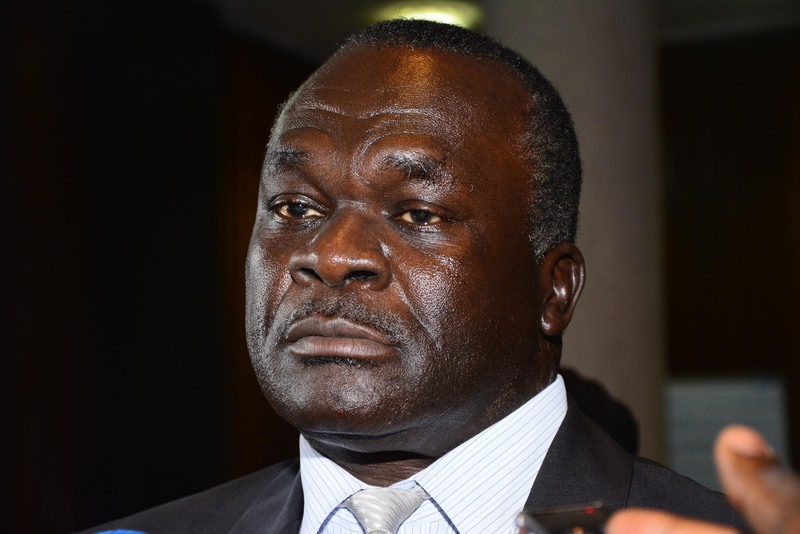 Parliament’s Appointments committee on Friday approved the nomination of Justice Alphonse Chigamoi Owiny-Dollo as Deputy Chief Justice. Justice Owiny-Dollo’s approval on September 8 2017 followed a face-to-face meeting with the committee chaired by Deputy Speaker Jacob Oulanyah during a one-hour interaction. The nod gives him the green light to replace Justice Steven Kavuma, who retires from the same position at the end of September. Kavuma has had a very tumultuous tenure during which he faced accusations of bringing the court into disrepute with many of his politically-tinged decisions. Sources who attended the meeting said Owiny-Dollo was asked a barrage of questions, ranging from corruption within the Judiciary as well as case backlog, which has seen several courts swamped with cases. While speaking to the media shortly after being vetted, Justice Owiny-Dollo distanced himself from fears that he is a cadre judge, as has been insinuated in some legal circles. “What is a cadre and in Law School, they don’t teach us to be cadres. In my 23 years of private practice, the word cadre never appeared in my pleadings or litigations,” he stated. Questioned about the bad public image of the Court of Appeal which has been headed by Justice Kavuma, he said the courts of law must always act as an arbitre to bring peace. “Once there is no confidence in the courts of law, it is the beginning of anarchy, insecurity and instability so those are serious issues,” Owiny-Dollo said. “I have been in court since 2008 and nobody has ever called me and said write a judgement this way or that way,” he said in a defensive tone. He was even more defensive when asked about his predecessor, Justice Kavuma’s term in office and declined to comment on his legacy. “Mine is not to pass judgement on any person. I believe when the instrument, assuming I am approved by Parliament, will not mention my predecessor (Kavuma). I will be guided by the Constitution and want the court to succeed. If there are certain things in this court which were not properly done, I’ll need to study. I don’t go by rumours,” Owiny-Dollo said. Some of the MPs on the Appointments Committee questioned him on how he would tackle the challenge of case backlog. He told journalists that the solution to case backlog would be through recruitment of more judges. “Some of the solutions would lie in the courts, while others are beyond us. You have ten justices in Court of Appeal and they sit in panels of three yet they have an array of cases to handle. It is humanly not possible to deliver justice with such numbers,” he added. The committee received petitions from Uganda Association of Women Lawyers (FIDA) and Uganda Law Society (ULS), protesting the nomination of only male judges. While ULS demanded for an open vetting system however the committee rejected their pleas. Also approved were Justices Richard Buteera and Paul Mugamba to the Supreme Court bench.